It’s so true. “Love is wild.” It’s a journey that throws curveballs when you least expect it but its when you’re able to conquer them that you know it’s true love. In Sanguine Theatre Company’s presentation of Crystal Skillman’s Wild we watch that curveball testing the relationship of a young couple. When one foolish mistake is made, it is a catalyst for more errors that tests the true love between Bobby and Peter. 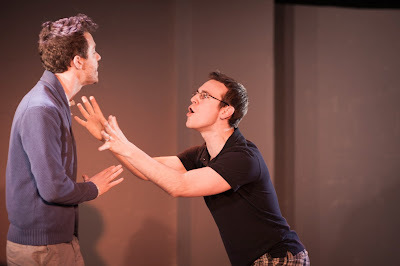 In Skillman’s poetically colloquial and engaging play, a foolish Peter has little beachside rendezvous with a young woman named Nikki, truths come out thusly putting skeptical Bobby and Peter on the rocks. Bobby, in his own drunken stupor begins an affair with Jordy, the feisty and horny young intern who just so happens to work at the same company as Bobby and Peter. More beachside encounters begin including Peter with a hunky man of free will named Vin. But in the end, love prevails and the couple is happy again. I had a hard time rooting for Bobby and Peter getting back together. The hopeless romantic in me wanted to but the observer just couldn’t. We never truly see the happy and good times between Bobby and Peter. Sure, in their five-year relationship we’re told they were happy but the first time we see them on stage together, it’s to reveal the beginning of the potential end. The domino effect leads Bobby to an affair with intern Jordy and Peter in his own with Vin. As we watch these moments, this is when we see Bobby and Peter exclusively happy and can’t help wonder if these are the true pairings we want to see in the end. Yes, Bobby and Peter are each other’s true loves, but being told this through exposition and seeing nothing but trouble, do we truly understand the totality of their love or trust that it’s real because we all want a happy ending? Sure, love has to travel over some bumps in the road, but when we only see the bumps that don’t seem half as a bad, why not continue down that road. Additionally, the plotline with Ted, Bobby’s nurse brother who’s watching over Peter’s father, seemed a little much and not that necessary. Besides that, the script is a knockout. One of the great achievements in this production is the top-notch ensemble assembled. Hunter Canning and Jeff Ronan were the perfect yin and yang as Peter and Bobby respectively. Canning and Ronan gave solid performances exuding the right amount of heart and wit. Diana Stahl as Nikki was superb. Though only in two scenes, she was stellar, with the latter scene being one of the best in the script. Despite an erratic final scene, David Armanino as baby-faced Jordy was seductive yet juvenile, allowing for great chemistry against Ronan’s Bobby. Vin played delightfully by Lyonel Reneau had a gruff exterior yet was nothing but zen. Director Evan F. Caccioppoli expertly tackles Skillman’s story, discovering some wonderful moments and creating some beautiful stage pictures on Jonathan Cottle’s sandbox set and atmospheric lighting design. The only attention to detail that seemed to be odd was the arc of when Peter and Bobby were and weren’t wearing their engagement bands. Until we learn the outcome of Peter and Bobby, Wild is a wonderful relationship play that is accessible and relatable. We’ve been down the path of love before, but Wild puts it in perspective. You’ll go wild if you don’t get a ticket soon.